This annual event is the primary fundraiser for Simply Women Ohio. This is the 11th year the event will be held! It is a very exciting time for us! The race date is June 29th, 2019 and it will begin and end at Yellow Springs High School. 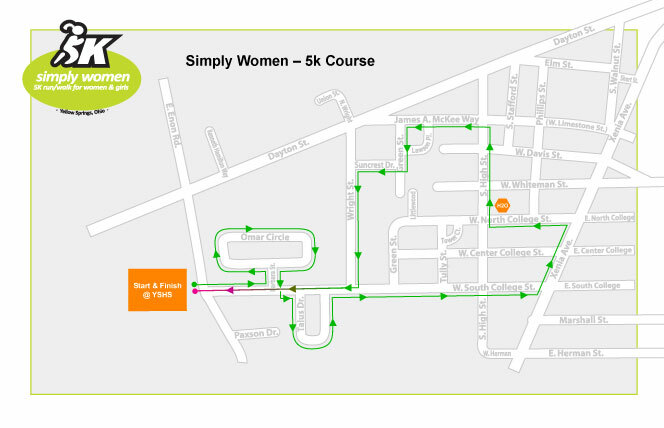 The 5k route takes participants from the high school through the streets of Yellow Springs. Women of all ages (really!) enjoy running or walking this flat course. The Yellow Springs Police Department assists with traffic control. We have a lead motorcycle that provides added safety and guides racers through the route. Participants are treated to pre-race warm-ups with a certified personal trainer, mid-course water station, finish line awards, drawing for prizes, and great post-race refreshments. We also have several community members who come out each year to cheer on our participants. Join us for this fun and empowering event for women and girls! Proceeds benefit Simply Women Ohio — To develop, promote and administer activities that support the participation of women, young women, and girls in athletics and in the development and maintenance of healthy lives. Mail in registration (P.O. Box 813, Yellow Springs, OH, 45387) can be downloaded at www.keysports.net/ or by clicking here. Early packet pick-up and registration: Friday, June 28th at Yellow Springs High School Gym (rear) from 6:00p to 8:00p. After June 19th, and same-day registration you are not guaranteed a t-shirt. Enter for a post-race prize drawing. Must be present to receive prizes. Fund annual “Girls Night Out” event since 2012. Support for these events are in conjunction with the Human Relations Commission, 365 Project, and YS Police department. Over 100 girls per year, grades 5-12, attend this evening of fun, dancing, guest speakers, food, and break-out groups on topics relevant to young women. Provide sponsorship for the “Elemental Sexual Assault Prevention” program delivered grades 7th – 12th, each year. Purchase Basketball warm-up jerseys for all middle school and YSHS Varsity girls teams. These warm-ups provide a sense of team unity and bring a sense of “credibility” to the pre-game warm-up. These jerseys remain with YSHS and are not owned by individual players so they will be enjoyed for years to come. Sponsor purchase of Softball team t-shirts and hoodies. Provide major funding for purchase of 7th grade Volleyball and Varsity Basketball uniforms for YSHS girls. Present annual $500 scholarship, “Simply Women Leadership in Athletics Award,” to a graduating senior. This annual award goes to the scholar athlete who best exemplifies “an enduring model of leadership and commitment to athletics.” This award is not simply for athletic accomplishment, but also the fostering of good will in the school as a vehicle for healthy lifestyles both on and off the playing field for young women. 2019 is the 9th year granting this award. Provide scholarships to female athletes in need for gear or fees so they can participate in sports they would otherwise be unable to join. Sponsor the 2012 purchase of team t-shirts for YSHS Girls’ Volleyball, Soccer, and Cross-Country. Fund a 2010 event in conjunction with the Equity in Female Athletics Committee at YSHS called “That Girl’s Got Game” (a panel discussion for girls 6th through 12th grades featuring adult female athletes who shared their school-age and adult athletic experiences—34 girls participated). Plan for future events for girls in elementary, middle, and high school.